We are a congregation of the United Church of Christ (UCC). The denomination’s logo includes Jesus’ prayer from John 17:21, “That they may all be one,” reflecting our commitment to unity and acceptance of all. First Congregational UCC began in 1954 and moved to the present location in 1956. 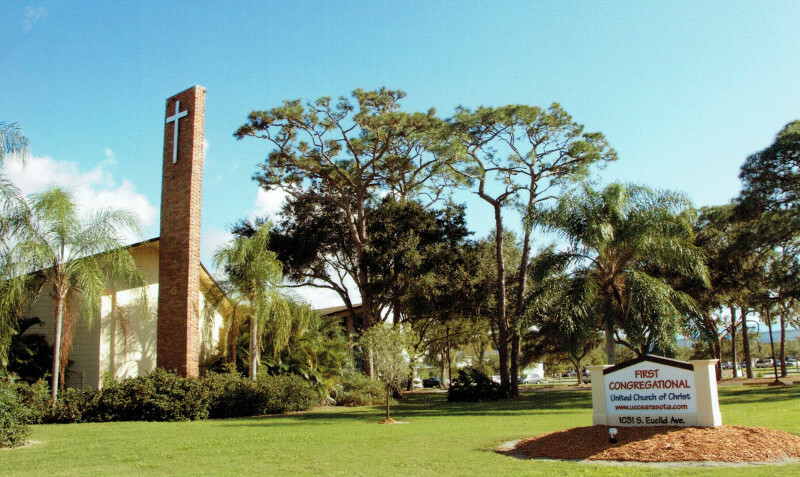 The purpose of the First Congregational United Church of Christ of Sarasota shall be to worship God, to preach the gospel of Jesus Christ, to celebrate the Sacraments, to realize the Christian Fellowship and unity within this church and the Church Universal, to render loving service toward all persons, and to strive for righteousness, justice and peace. We are disciples seeking to become apostles who share God’s word in faith and action in our family, our community, and our world. Provide for the spiritual, emotional, educational, and social needs of our community and the world around us. We, the laity and clergy of First Congregational United Church of Christ, are all ministers. Guided and inspired by God’s Word, we are open to God’s continuing revelation – in our hearts, our minds, and our actions. We are a joyful, passionate, and compassionate Christian family through whom God works. We welcome, embrace and serve persons of every race, nationality, ability, age, sexual orientation and gender. We invite all to join and participate fully in the life and ministry of our church. Orchard Place, a 40 unit HUD facility for physically challenged adults.